A global leader helping organizations and individuals find purpose and create change. Manny Ohonme has achieved international recognition as a philanthropist, social entrepreneur, businessman, author, and speaker. Manny is founder, president, and CEO of Samaritan’s Feet, a nonprofit organization established in 2003 that has provided more than 6.5 million pairs of shoes to individuals in need across 88 countries around the world and in hundreds of cities across the United States of America. 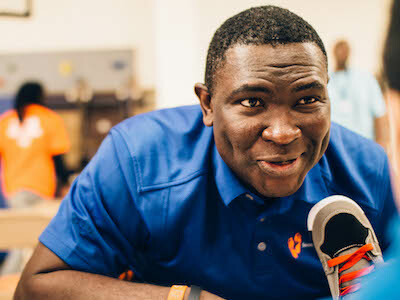 His organization has worked with more than 100,000 volunteers; and now, after developing and starting to manufacture the Samaritan’s Feet innovative World Shoe, Manny and his team are focused on realizing the day when there will no longer be any shoeless children. With more than 20 years of experience as a global leader, Manny enjoys sharing his insight, along with his inspirational story of being born in Lagos, Nigeria and how shoes become the symbol of hope and the vehicle to help transform the lives of millions of people living in poverty around the world. 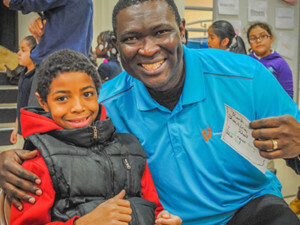 As a speaker, award-winning motivator, and author of the book, Sole Purpose, Manny is regularly featured on regional and national media and addresses audiences large and small, from national association trade shows to the boardrooms of Fortune 500 companies, from school-wide assemblies to private meetings with heads of state. His broad-ranging expertise and global vantage point, afford him the opportunity to cover a wide range of topics. You’ll find some of the most popular topics detailed on this site, but Manny can also customize content to fit any event and duration needed. So, if you are looking for someone who will engage and inspire your audience with proven strategies and lessons learned at the global level, look no further than Manny Ohonme. Manny can tailor a presentation, workshop, or program to suit the needs of your organization, in terms of content, aims, and duration. He delivers everything from fifteen minute ‘pep talks’, thirty to ninety minute keynote corporate addresses, to two-day, life-changing live-in programs. Read the dramatic story of how Manny’s first pair of shoes, received from a missionary at the age of nine, transformed Manny’s life, and how it became a catalyst for an organization that is giving hope and opportunity to millions of people in need around the world.